I am a bookworm. For as long as I can remember, books have been my love language. My dad used to joke he’d have to buy the house next door to ours in order to house all my books. Sometimes, I think my husband feels the same way. 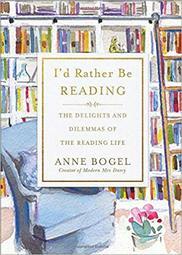 Because of my love for books, I was excited to read Anne Bogel’s I’d Rather Be Reading: The Delights and Dilemmas of the Reading Life. I’d Rather Be Reading is meta. It’s a book about reading that contains 21 essays related to books. Although it was a slow start for me, about five essays in, I realized every time I read I’d Rather Be Reading, I did so with a silly grin on my face, delighted to read something by someone who obviously knows me so well. I often saw myself in Anne’s essays. I laughed aloud in Bookworm Problems because every stanza described me. I also saw myself in The Books Next Door, when Anne confesses how “the nearness of the library shaped the rhythm of our lives.” That has been the case for me as well. 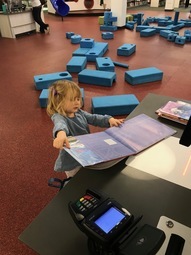 In fact, before purchasing our new home, we carefully evaluated its distance from the library. While the library isn’t next door, it’s close enough to impact the rhythm of our lives. As a fellow parent, I particularly enjoyed the essays in I’d Rather Be Reading that connected to child rearing. Whether it be quoting Anna Quindlen to say, “I would be most content if my children grew up to be the kind of people who think decorating consists mostly of building enough bookshelves” OR Anne sharing her hope that her kids will one day “discover that they too are book people… because reading is part of who they are. It’s in their blood”, I found myself thinking, "I want that for my daughter, too." Although I’d Rather Be Reading is published by Baker Books, it is not religious. Any bookworm will see themselves in this collection of essays. For that reason, it would make a fantastic gift for the readers in your life. Disclosure: I received a free copy of I'd Rather Be Reading from Baker Books in exchange for a fair and honest review.